Welcome back to the -EST blog! This is where I chat about some of the astronomical superlatives that go the extra distance to make our universe so interesting and awesome. In this post I’m going to talk about a pretty popular topic, the darkest things in our universe – black holes. A lot of people think of black holes like giant outer space vacuum cleaners. While they do end up “sucking in” anything that gets too close, this isn’t the most correct way to think about them. Black holes are pretty seriously complex, but I am going to step back to some basics and try to build a decent picture. Black holes are the darkest things in our universe because they emit no light whatsoever in any wavelength. 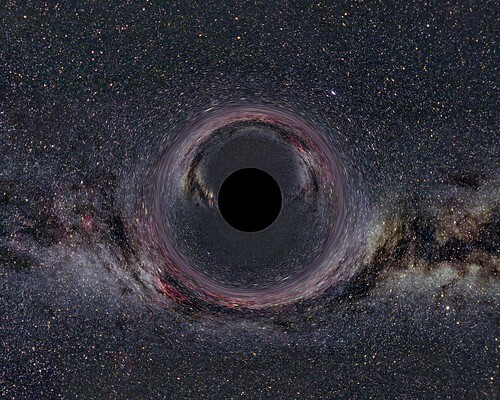 The reason there are no images of black holes themselves is because it is a fact of their physics that they cannot be seen (The image above is an artists conception). Any light that gets too close falls in and can’t get back – this makes black holes problematic because that is how we see things, we see the light that comes back to our eyes. So if black holes produce no light and no light that falls in can ever get back out they can never be seen. But we can still study them and deduce how we think they work. Let’s take a few steps back to try and get our bigger picture. So, first step, black holes are basically extreme gravity. Gravity holds our feet on the ground and the air on our planet; it is a fundamental property of mass – anything that has mass has gravity, no matter what. Earth has a fair bit of mass and so can hold us on its surface. The Sun is much heavier than Earth so its gravity is much stronger making it able to hold all of the planets in orbit around it; things have more mass have a stronger gravitational pull. But what is gravity, really? We know that it makes apples fall from trees, but why? This is where it starts to get a little complicated and requires a bit of imagination and creative thinking. Our current theory of gravity is this – it’s a fundamental property of mass that it bends the space around it. A common analogy is thinking about a ball bearing on a stretchy sheet. The ball will bend the sheet and if you roll another ball just right you can get it to curve around the first. And a heavier ball will bend the sheet more than a lighter one (this explanation is a little circular because it’s explaining gravity with gravity, but it’s still a great way to visualize what we’re talking about). The generated images below can give you an idea of how more massive things bend space more than less massive things – these images only show space in two dimensions for slightly more simplicity. The Earth hardly bends the space around it at all because, astronomically, it quite small. The Sun is over 300,000 times the mass of Earth so it bends the space around it much more. Now imagine that you take something several times the mass of the sun and squeeze it down to be the size of a marble – that’s a lot of mass in a really small space. Something that’s that dense will make a HUGE dent in space. Black holes are infinitely dense and infinitely small so they end up bending the space around them so much that they end up turning it into a sort of funnel that would cause anything that came too close to fall in. In the image above there are several blue lines that illustrate how an object might travel if it came close to the black hole. Notice that only the inner most lines leads to the downward spiral into the black hole itself. The point that is considered “too close” is called the event horizon, illustrated above by the black line partway down the “funnel”. By the time anything reaches the event horizon, its ticket it punched, and nothing can escape – even light. Here the gravity is too strong and everything, including photons of light, gets pulled down to the point of infinite density and smallness called the singularity. What happens at the singularity is still a big question in physics today. It’s where the rules that we know now start to break down and things get really crazy and weird but there are lots of people trying to figure it out. So that was an attempt at a quick and dirty explanation for what black holes really are. Another question you might be asking is – if black holes emit no light and the light that falls in never escapes, how do we know black holes are out there? The trick is that we can see things that are close to black holes. We can look for stars orbiting some invisible super-heavy dark object that we can’t see. We know that stars don’t travel in tight little circles unless there’s something really heavy that it’s orbiting so we can make a guess that a black hole is there (this is how we think we know where the black hole at the center of the Milky Way galaxy is). Another common method of looking for black holes is to look at accretion disks. I talked at length about accretion disks in my last -EST blog post about active galactic nuclei. Accretion disks are disks of diffuse material that form around a central body. Gravity causes this material to spiral inwards toward the central body. As the material spirals in toward the massive central body, it heats up (the technical description for this is the angular momentum of the material being transferred to into radiation) and this heat escapes the gas and dust in the form of light. Because this material is extremely hot, the light that is coming off of it is extremely energetic, usually escaping in the form of x-rays. This light is being before it is too late to escape the extreme gravitational pull of the black hole so this light ends up radiating outward in all directions. The important part about this light is that we can see it! Telescopes that are looking for high energy light can detect these x-rays which can then tell us where the accretion disk is so that it can be studied to see if a black hole is at the center or some other astronomical body. So, it’s a bit unfortunate, but we have to resort to indirect methods of “seeing” black holes but the awesome part is that we can and we do! Black holes are still being thoroughly studied because they have so much more to tell us about physics and the universe than we already know. I hope that this has been a good workout for your brain but I also hope that it has helped to create a more complete and accurate picture of black holes as we continue to explore the crazy and truly awesome thing that is our universe. Thanks for reading about the darkest things in our universe and keep checking out cool astronomy concepts and news with Blueshift!